We have received compensation and/or products in exchange for this promotion. All views and opinions reflect those of our own. Sponsors are responsible for their individual prize fulfillment. Are you searching for the right gift for your child? 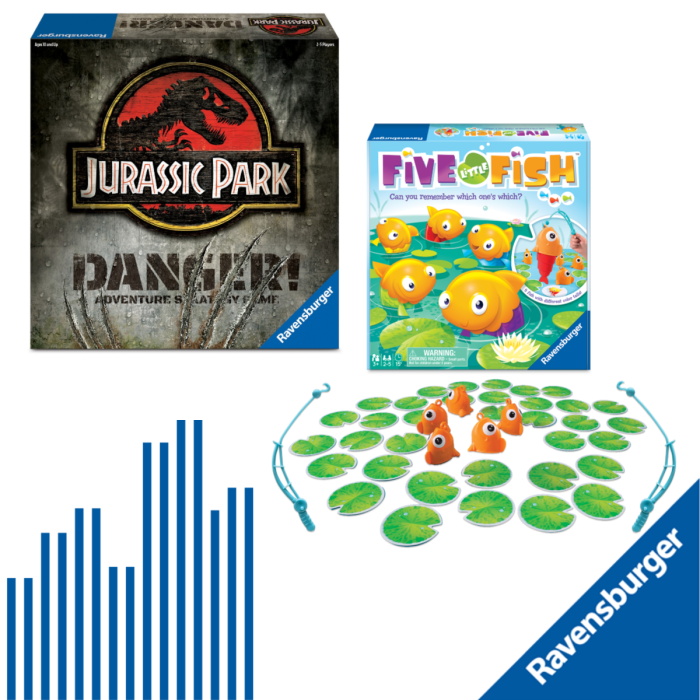 Perhaps you're wanting a gift that will inspire more co-play time with your kids? Look no further! I've curated a list of some fun games for a variety of ages and a toy brand that has stood the test of time for our family! Check them out and you'll discover the perfect addition for under your tree. 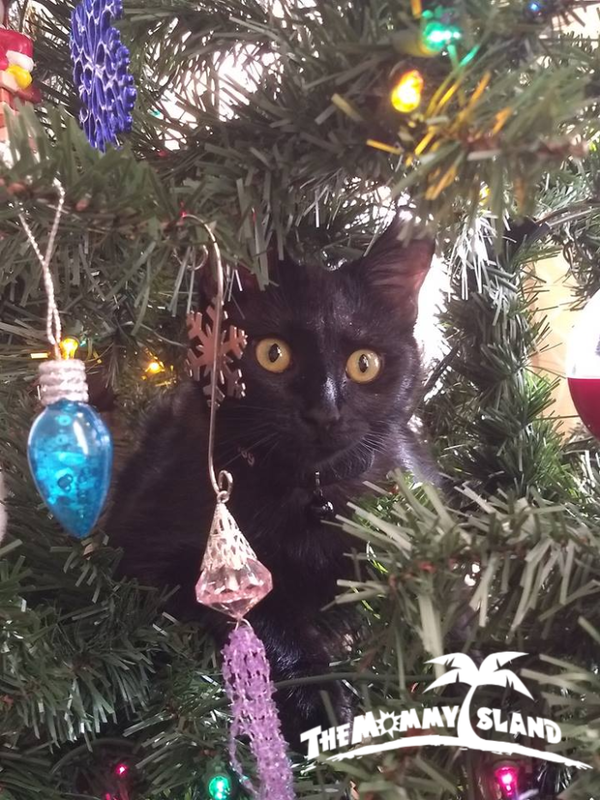 Now, I just have to figure out how to keep our cat out of the tree! Hunt as the Dinosaurs... or survive as the Humans! The first visitors have arrived at Jurassic ParkTM to see its miraculous dinosaurs firsthand. But chaos has hit Isla Nublar— the power is out, and the prehistoric creatures are on the hunt! One player controls the T. Rex, Dilophosaurus, and Velociraptor, prowling through the jungle to attack the humans. The other players team up as characters from the classic movie, struggling to get Jurassic ParkTM back online and escape the island before they become prey! For ages 10 and up. Flip a Lily Pad Card to see which fish to catch. Use a Fishing Rod to hook the fish you think will match. As you reel it toward you watch as your fish expands accordion-style to show its colors. If it's a match, you keep the catch! Pay close attention! The fish change positions. Can you remember which one's which? Catch the most fish to win! For ages 3 and up. Our kids love playing this game! Sassy Miss is only 3-years-old so it took her a little while to just get the hang of taking turns. She kept getting really excited and wanting to fish out of turn, but after a couple of rounds, she got the hang of it. Our only problem with this game is that she never wants to put it away! She's begging to play her "fishy game" all the time. This game does require a small amount of coordination and as I mentioned some patience, but it made a big splash with our kids. Here comes the passenger train! 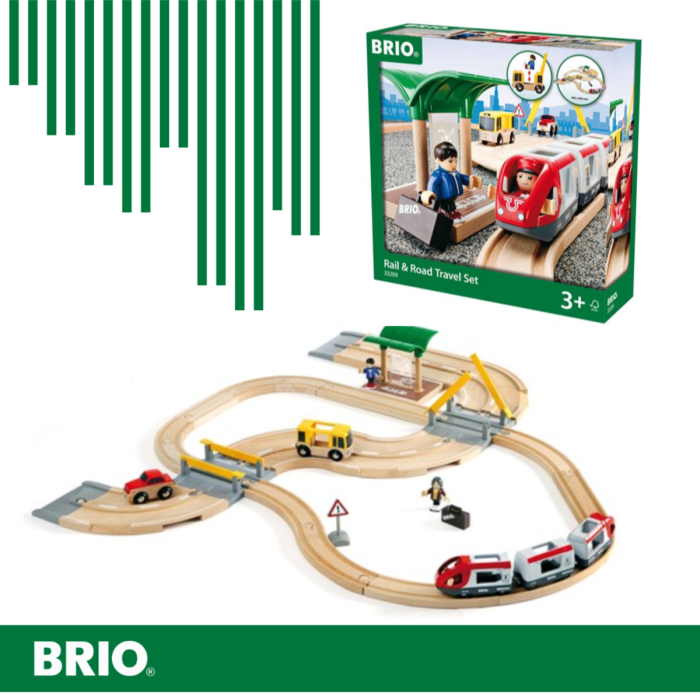 The rail and road travel set with the two-wagon train is ready to take the passengers around this magnificent BRIO train world. Look out the window and see the cars stopping at the road crossing along the train tracks. Lucky that the train arrives on time, some passengers need to switch over and catch the bus! For ages 3 and up. The Booper has loved trains since before he could talk, and even now at almost 9-years-old he still gets excited seeing trains on the tracks. One of his first wooden train sets was a BRIO set, and he played and played with it. I'm not sure how many times that little train circled round or how many times I heard him making the chugging sounds while playing but that little beginner set from BRIO stood the test of time. Now we have a new little engineer in our house, Sassy Miss has followed in her big brother's footsteps and loves trains too. I think his passion for trains was catching. It's great seeing his older sets active again and we're adding new pieces to grow the village. My favorite thing about this wooden set is that it's compatible with other sets and lends well to their imaginations! The game of risky rolls and fabulous fortunes! Everyone gets crazy rich, but who will end up the richest? With each roll you'll have a chance to rake in the dough but be careful, the tables could turn at any moment and you need to gather the most before the bank runs out. Roll the dice and buy amazing investments for your empire —a candy factory, a pro soccer team, or a movie studio. You decide what risks to take as you collect companies and become a Zillionaire! For ages 8 and up. Team up to protect the city! Trouble is erupting across Metroville, but The Incredibles can save the day! Each player has a unique power, so strategize who will take on each challenge, and work together to stop the crimes before it's too late! As the alarm goes off across the city, tiles are flipped over on the game board, revealing new problems and even changing the game board paths. If you can defeat the villains and save the citizens before time runs out, you'll be the heroes of the city! For ages 6 and up. The rowdy game of riches and risks. Dig deep in the card deck to mine for gems but be careful, other prospectors may try to steal your claim! 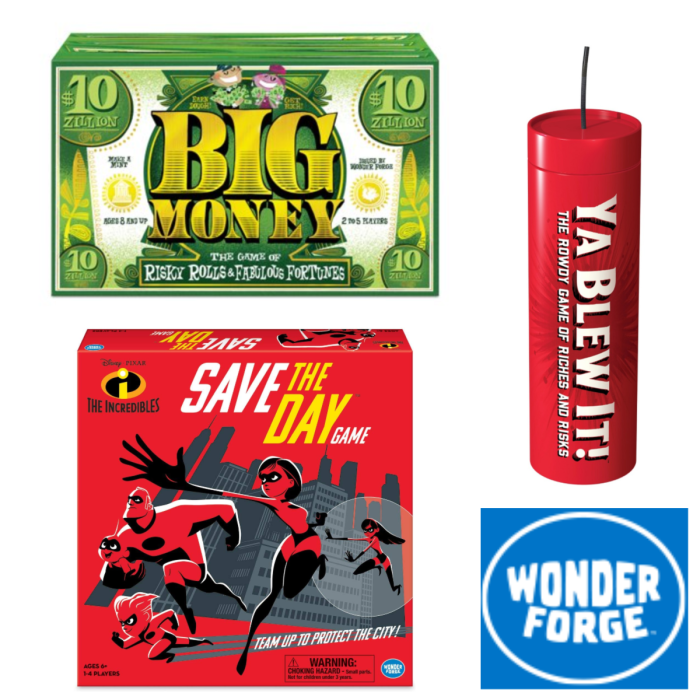 It's explosive push-your-luck fun with every suspenseful roll of the dynamite dice! Wonder Forge - Ya Blew It! Wonder Forge - The Incredibles Save The Day! Open for entry from 12/14-12/19/18 at 11:59 pm EST. Open to entrants in the US, 18 years and older. The winner will have 24 hours to respond to the notification email and fill out the form to claim this prize or a new winner will be selected. Sponsor is responsible for prize fulfillment. Please note: prize will not arrive in time for Christmas. Be sure to scroll down to discover all the other great giveaways on this event! 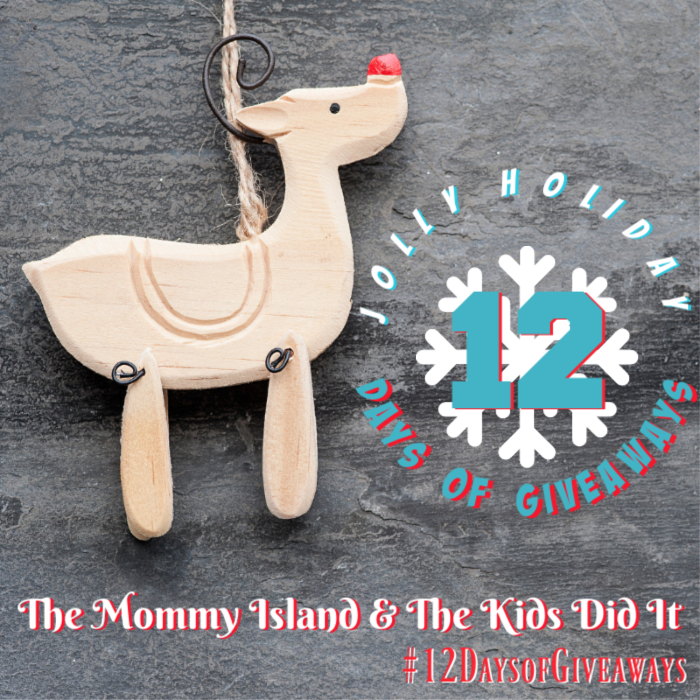 Follow The Mommy Island on Instagram then enter below. I like their puzzles with animals on it. The BRIO Labyrinth Game & Boards has gotten an upgrade for the better! You can add boards to make the game easier or harder. I’m glad because the original was hard for me. We would also love to have Pictopia: Harry Potter Edition! Thank you so much for this opportunity. It would be great to have these to have more family time. We love playing games and spending time together but I feel like we play the same games over and over so this would help a lot. Thanks again! I want the Musical Xylophone for my granddaughter. I also think the Disney Villainous game would be a hit in our house!